Home | Practice Areas | Workers’ Compensation | When Do My Workers’ Compensation Benefits End? If you were injured on the job in Pennsylvania, you are eligible to receive workers’ compensation benefits. If you are only partially disabled, you will receive the benefits for up to 500 weeks — until you are healed and can return to your job or your employer finds a new position for you that takes into account your injury. Your employer and their insurance company, however, hate paying workers’ compensation benefits and are constantly looking for ways to game the system to stop those benefits even if you are still recovering. Being aware of the methods your employer or their insurance company can use, as well as the legitimate reasons why you can leave your benefits, is very important. Can I Still Receive Workers’ Comp Benefits If I Fail a Drug Test? Can Workers’ Compensation Benefit Stop Without Notice? Can I Lose Workers’ Compensation Benefits When I Turned 65? Should I Hire a Lawyer If I Am Worried About Losing My Workers’ Comp Benefits? 1. You fail to comply with medical treatment ordered by a doctor. The purpose of workers’ compensation benefits is to help you with medical costs and provide you with income while you are recovering from a work-related injury. Therefore it is crucial that you make every effort to recover from an injury and return to your job. Following any medical treatment ordered for you by a doctor is an essential part of the recovery process. If your doctor orders medical treatment and you do not follow it, you could lose your benefits. 2. You ignore a request from your employer to have a medical exam. Under Pennsylvania law, your employer can request you take an independent medical exam (IME). Employers and their insurance companies will often use this as a tactic to avoid paying any further workers’ compensation benefits. Under Pennsylvania law, however, you are required to submit to this exam. Even if you are still injured, and you think your employer is trying to pressure you, you still need to take the exam. You should also contact an experienced workers’ compensation attorney if you have not done so already. 3. You commit and are convicted of a crime and are sent to jail. If you go to jail, all your benefits will end. This is true even if you have family members who are dependent upon these benefits. 4. You do not complete and return the employee verification form to your employer’s workers’ compensation insurance company within 30 days. This form requires you to report if you had any other job or received any other wages during the time you have been receiving workers’ compensation benefits. It is critical that you fill out this form on both sides and sign it and return it to the insurance company within 30 days. If you do not do so, the insurance company can stop your workers’ compensation benefits until you have filled out the form. The company is not required to pay for any gap in the time between the 30 days and when you finally send in the form. And make sure you sign it. The Commonwealth Court of Pennsylvania has decided that an unsigned form makes it incomplete. 5. A judge reviews your claim and suspends or terminates your workers’ compensation benefits. When your benefits are suspended this means that your lost wage payments are ended. It does not end your workers’ compensation medical benefits. If a judge reviews your case and terminates your benefits, you will lose both wage and medical benefits. An experienced workers’ compensation attorney can help you appeal any judicial decision. When you sign this final receipt, it means that you have agreed to stop receiving benefits. Never sign anything without first consulting with an experienced workers’ compensation attorney. You may be signing away benefits to which you are entitled. 7. The partial disability 500-week period has ended. If you are healed enough to return to the job and your employer assigns a modified position that considers your medical restrictions, but you are receiving less income than you did before your injury, you can still receive partial disability benefits. These benefits end after 500 weeks (or 11.6 years). Once the 500-week period ends, your employer will seek to terminate your workers’ compensation benefits, but you may still have the right to continue receiving benefits if your injuries persist. When you are nearing the end of the 500-week period, consult with an experienced workers’ compensation attorney about how to proceed. 8. You return to work, and you are earning as much or more than you did before the injury. In this case, the company can terminate your wage loss benefit but will need to continue paying any medical bills if you have not fully recovered from your work-related injury. 9. You agree to accept a lump sum from the insurance company. This is another way that an insurance company seeks to pay you less and what you are fully entitled to receive. Before you sign any lump sum agreement, make sure you talk to experienced workers’ compensation attorney. 10. You die but not from an illness or injury related to your workplace. If you die because of your work-related injury or illness, however, your family can receive survivor benefits. In many cases, yes. Many employers will drug test employee after a workplace accident, especially if it was a motor vehicle accident. If the test is positive for drug use, the employer will try to deny your claim. They may also fire you. While there is little you can do if your employer terminates you, in many cases, they cannot stop you from receiving workers’ compensation benefits. The smart thing to do is in most cases is to stay clear of drugs, especially just before you report to work. As long as you were not intoxicated, however, and you were injured on the job, you may still be eligible for benefits. Although results can vary from case to case, working with an experienced workers’ compensation attorney will significantly increase the chances of you being able to receive benefits despite having failed a drug test. No, they cannot. Even under the nine items listed above, your employer is required to notify you that they are seeking to end your benefits. In many cases, you will receive a “petition to modify, suspend or terminate” your benefits. This often happens if your employer suspects you are “faking it” or they want to argue that your injury was not suffered on the job. In either case, a workers’ compensation judge will hold a hearing and decide the merits of your case. Another favorite tactic of the employer or their insurance company is the independent medical exam mentioned above. In many cases, this “exam” will only last five to 10 minutes and the doctor — who has usually been selected by the employer or their insurance company because of their record in turning down workers’ compensation claims — will issue a report saying that you are healthy enough to return to work. Your employer will then file a “Petition to Terminate Compensation Benefits.” If your own doctor, however, disagrees with the employer’s doctor and does not believe you are healthy enough to return to work, you can refuse to return to the job. Even if your employer then files the termination petition, you will continue to receive workers’ compensation benefits until a judge reviews your case. If your own doctor, however, feels that you are ready to return to work, but you do not agree with them, there is a good chance that your workers’ compensation benefits may end. In this case, a consultation with an experienced workers’ compensation attorney about whether you should return to work is a good idea. Your employer can also file a petition to terminate or modify your benefits if they offer you a job that considers any medical restrictions you may have, but you choose not to take it. Another sign that your employer is about to try to end your benefits is if you are contacted about interviewing with a vocational consultant. This is a consultant hired by the insurance company who wants to try to convince you that you may be able to return to work performing another job in another location. Remember, the primary purpose of the vocational counselor is not to help you find new employment but to help your employer find ways to terminate your benefits. If the vocational counselor recommends jobs to you, but you refuse them because you know that you will not be able to perform them, your employer will then file a petition to terminate your benefits based on the vocational counselor’s recommendations. An experienced workers’ compensation attorney can help you fight back against all these attempts by your employer and their insurance company to either limit or terminate your benefits. 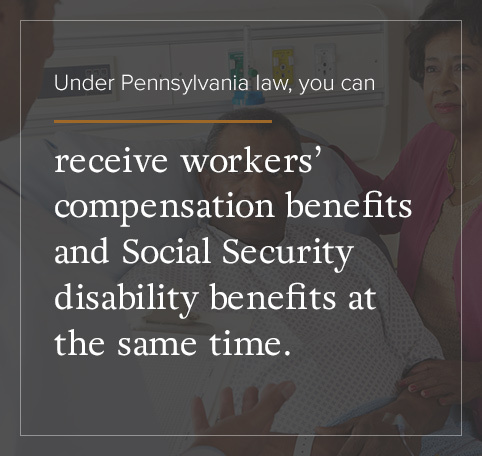 Under Pennsylvania law, you can receive workers’ compensation benefits and Social Security disability benefits at the same time. When you reach the age of 65 years and 10 months, however, your Social Security disability benefits turn into full Social Security retirement benefits. At that time, your employer and their insurance company may take a credit or an offset and reduce your workers’ compensation benefits. If you are receiving wage loss benefits when you begin to receive Social Security retirement benefits, your employer or their insurance company can reduce their wage loss payments by 50 percent of what you are receiving in Social Security retirement benefits. If, however, you were already receiving Social Security retirement benefits and were injured on the job — after all, many older Americans are working past “retirement age” these days — then your workers’ compensation benefits will not be reduced. If you are receiving workers’ compensation benefits and then begin to receive a pension, the employer or their insurance company can reduce the workers’ compensation benefit by the amount of money they paid for their share of the pension. It is very important if you are considering retiring that you contact an experienced workers’ compensation attorney beforehand to discuss how your retirement may affect your benefits. Employers and their insurance companies hate paying workers’ compensation benefits. In very few cases will they pay those benefits without putting up a fight. It is the job of insurance company advisors to find ways to either modify, limit or terminate workers’ compensation benefits. And since they do this every day, they know every trick that they can use to achieve their goal. This is why it is essential to work with an experienced workers’ compensation attorney. The goal of an attorney is to ensure that you receive the workers’ compensation benefits to which you are entitled. That means helping you file all the correct forms on time, helping you gather the information that you need to build a solid case and then arguing that case either with the insurance company or in front of a workers’ compensation judge if your claim is denied. Workers’ compensation attorneys work on contingency, so they only get paid if you get paid. In Pennsylvania, the amount that workers’ compensation attorneys can collect is set by state law or by an agreement between you and your attorney. Workers’ compensation laws are written with the idea in mind that you may hire an attorney to help you with your case. Receiving a notice of an IME, being contacted by a vocational counselor or receiving a termination petition for your benefits from your employer are all reasons for you to worry that your workers’ compensation benefits may end before you have recovered from your work-related injury. The workers’ compensation attorneys at KBG Injury Law have the knowledge and the experience to help you fend off these attempts to terminate your benefits. We care deeply about our clients, and each case is important to us. We understand how important workers’ compensation benefits can be to you and to your family if you have been injured and are unable to earn a regular income. We also understand how difficult it can be when you have been injured to ensure you file all forms on time and are protected against any machinations by your employer or their insurance company. If you would like to know what we can do for you and how we can help you, you can call us at any time at 1-800-509-1011 or contact us online and leave us your name, contact information and the details about your case and we will contact you as soon as possible.